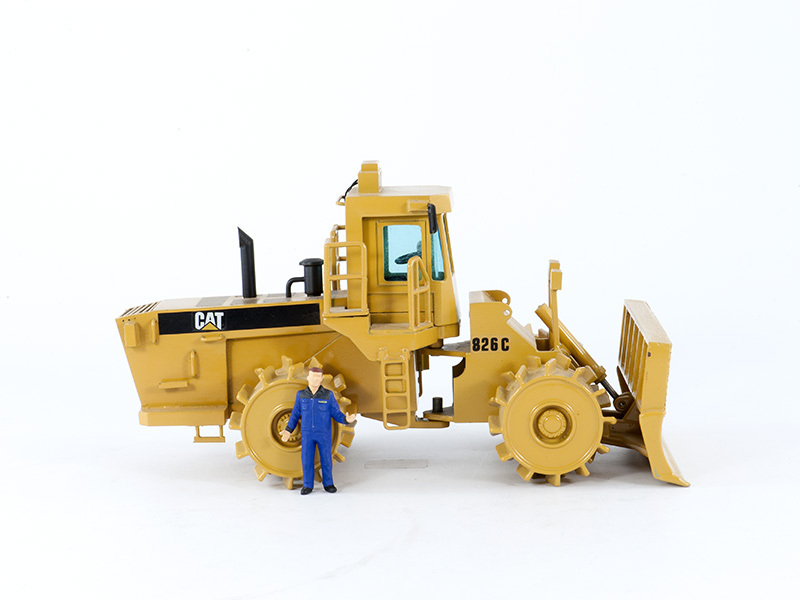 In 1963 Caterpillar introduced the company's first articulated Wheel- Loaders and Dozers. The first two articulated frame steering Wheel Dozers where the 824 and 834 model series. Both models were also released as a compactor model variation featuring a optional sheep foot or tamping foot steel wheels. But in 1970 both of these variations would be assigned new model nomenclature: The Caterpillar 824B became the 825B and the 834 became the 835 series. In 1978 Caterpillar introduced the special Landfill compactors 826C model, followed by the 836 series in 1993. Compacting to specifications is critical for soil, landfill, and paving applications. Caterpillar compactors are specifically designed for all compaction operations. The purpose built Caterpillar four wheel drive soil compactors maximize soil density through a tamping wheel tip design, machine weight impact and higher speeds for greater penetration. Caterpillar landfill compactors have enhanced features with additional guarding and attention to placement of components to ensure you get the most durable landfill compactor. Caterpillar Vibratory Soil Compactors are durable and reliable. They offer high compaction performance, speed and grade-ability to maximize productivity on a wide range of applications. Caterpillar Vibratory Asphalt Compactors are available in a range of sizes and configurations to meet any application. Large double-drums are simple to set up for maximum compaction efficiency on any type of mix. Caterpillar Pneumatic Tire Compactors are ideal for applications like wear courses and binder courses as well as compaction of natural soils and materials with lime or cement.